Erin in NYC spotted this one. 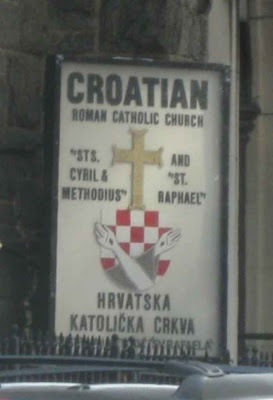 I guess the dudes you find when you go in this church are not, in fact, those saints. clearly a skeptic made the sign for them. Saint Expedite is very popular in New Orleans, even though he is not an officially recognized saint. His statues remain in churches, but now he is identified as "Saint Expedite", in quotation marks, since he is not considered a real saint (or should I say, not considered a "real" saint?). This is right by the Lincoln Tunnel. I "see" it every time I take the bus out of town.